The easiest of the sweatshirt jacket patterns. 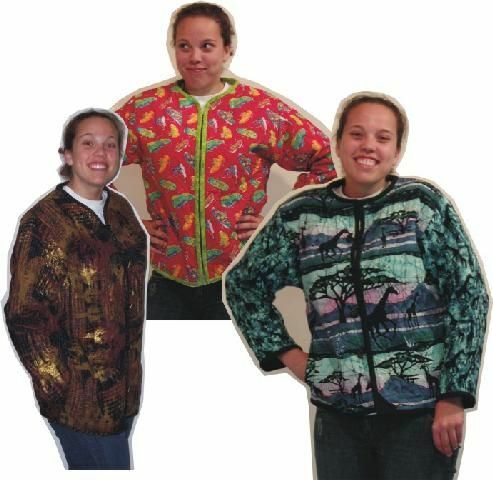 Combine some great fabric with easy machine quilting and a sweatshirt to get a one of a kind jacket. Two pocket options come with the pattern. Great one-day (6 hour) workshop, most people will get a good start and some may even finish. Before you begin, try on your pre-shrunk sweatshirt and make sure you can pinch at least an inch of fabric under each arm. If you can't pinch an inch on both sides then the jacket when finished will probably be too small. Tall sweatshirts may be purchased from our website.